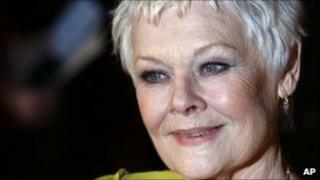 Dame Judi Dench has been named the greatest stage actor of all time in a poll compiled by an industry newspaper. "I'm completely at a loss for words, but it's one hell of a thing to live up to," Dame Judi told The Stage. Dame Maggie Smith came second, with Mark Rylance - the youngest actor in the list - in third place. A selection of industry experts were asked to suggest their favourite 10 actors. Readers were then invited to vote on the shortlist. In fourth place was Sir Ian McKellen, followed by Laurence Olivier at number five and Paul Scofield in sixth place. At number seven was John Gielgud, with Sir Michael Gambon in eighth place, Vanessa Redgrave at number nine and Ralph Richardson at 10. Dame Judi, now 76, began her career in 1957 playing Ophelia at the Old Vic Company in Liverpool. She then branched out into musicals and appeared in numerous stage plays as well as film. The star won her first Olivier award in 1977 for Macbeth, going on to win a further six . In 1996 she made history by becoming the first performer to win Oliviers for best actress and best actress in a musical in the same year. Three years later she won an Academy Award for playing Queen Elizabeth I in Shakespeare in Love.